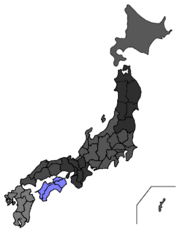 Shikoku (四国) is the smallest of the four main islands of Japan, nestled underneath much larger Honshu. It is also the least populated of the four islands, with 4,063,000 people recorded living in its four prefectures of Ehime, Kagawa, Tokushima and Kochi (2006). This is approximately 3% of the total population of Japan. Shikoku is linked to various other parts of Japan by ferries and domestic flights, and bridges also connect the island to Honshu. Shikoku has an extensive network of roads and railway lines, allowing easy access to the major cities of Takamatsu, Matsuyama, Tokushima and Uwajima. The last of these is famous for its bullfighting festival (where bulls fight each other) and a fertility shrine. Ravina (1995) draws on Mizubayashi Takeshi's model of the "compound state," and uses examples from the domain of Tokushima on Shikoku. Depending on the precise set of circumstances, great domains could be seen as vassals of the shogunate or as autonomous states under an independent daimyo, and therefore not only were multiple ideologies and sources of legitimation catered for, but a fixed distinction between the shogunate and the daimyo, or the center and the periphery, could be avoided. After being pensioned off by the Meiji government in 1871, Hachisuka Mochiaki, former feudal lord of the Tokushima domain in Awa Province on Shikoku island, invested his money in banking, commerce, and industry. These investments and his business strategies are an example of how former samurai fared in postfeudal Japan. Hachisuka's financial enterprises suffered losses over the 40 years following the abolition of his domain, although he was able to stay solvent and comfortable, partially due to his sound business acumen and ties to the Satcho clique in the Meiji government. Besides his business empire, Hachisuka went on to take several high posts in the imperial government, including posts as ambassador to France, governor of Tokyo, and minister of education. The battle over the location of railroad tracks in Shikoku, Japan, was affected by many factors, including the state of the national economy, the possibility of privatizing portions of the national railway, and local pressure. The ultimate compromise, which included stops at Kochi, Sagawa, and Susaki, was reached by Prime Minister Tanaka Mitsuaki in the 1920s. This page was last modified 04:53, 15 September 2013.